On a glorious saturday morning, we needed some grub. It had already started being warm. O had just gotten home for a break from Iraq. We knew that places like Sabrina’s and Morning Glory and Honey’s and such would have hours-long waits. So we knew there’d be a place nearby that wouldn’t be crowded at all – Cafe Apamate. Boy, were we right. We were the only people there for a bit until 2 more tables showed up. 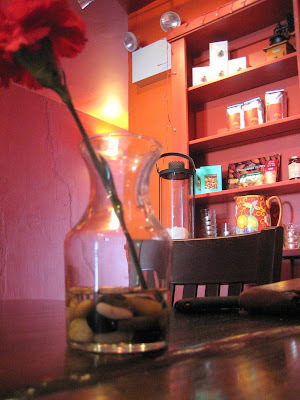 I love the decor here, especially the brick red painted walls. There were carnations on each table. J and O did not believe they were real, but they were. There was a bit too much a/c action going on there though. They needed to turn it down a notch. The tostas con pisto. 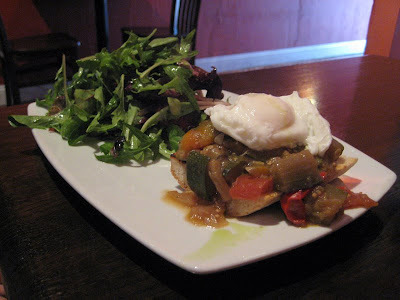 It’s a bunch of stewed veggies and a poached egg on top of bread. I had this the last time I was here. This is so damn good. I could eat a giant bowl of these veggies. It’s hard to eat though. You can’t actually lift it and eat it as an open faced sandwich. It’s definitely a fork and knife dish. O got the de carne hot sandwich. It had sliced rib eye with aoli. It’s served on an awesome baguette… crusty, chewy, delicious. You get your choice of fries or salad. Damn, those fries look good. 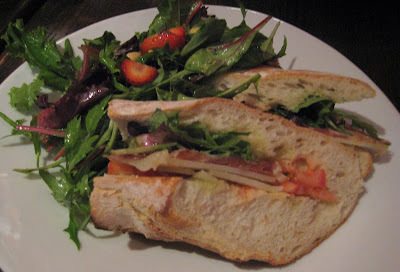 I got a cold sandwich, the serrano ham and machego cheese. It’s also served in the awesome baguette. It’s a lot of bread, and not enough ham and cheese, but still delicious. I got salad, and it’s a good salad, with strawberries, pine nuts, and a light zesty vinaigrette. The service is good here, but the food takes hella long to come out. Which is annoying, especially because there’s hardly ever any people there. I understand everything is made to order, but for real, it’s a long long wait. Which sort of makes me realize why it’s so empty here all the time. I can’t really say all the time though as I’ve only been here twice for brunch. For all I know, it may be hopping for dinner. But from my experience, it’s always been deserted here, and the food takes way too long to come out. I can see why some people wouldn’t want to put up with the wait. It’s a shame though, because the food is just so damn good. I just wish it would be prepared a bit faster. Oh, and brunch prices are incredibly affordable.